The reasons why I like Raiden are: <br/> <br/>1. Electricity manipulation has always been my favourite superpower. <br/> <br/>2. I've always loved the mentor archetype. I, for one, didn't mind most of his decisions in MK9; he interpreted the vague visions as best as he could. Dark Raiden - or Dork Raiden, as I like to call the post-Deception version of him - as shown in Deception and Armageddon, was a change in character that I didn't like very much. (His Deception ending is great, though ... and that's about it.) <br/> <br/>3. His torpedo move and the associated gibberish. :legacy_grin: <br/> <br/>4. One look at his character design and/or portraits, and you know he's a badass. 1. Electricity manipulation has always been my favourite superpower. 3. His torpedo move and the associated gibberish. 4. One look at his character design and/or portraits, and you know he's a badass. 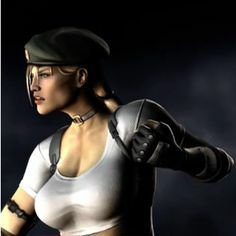 <img src=http://i100.photobucket.com/albums/m10/Mister799/Mortal%20Kombat%20Girls/Sonya%20Blade/Cut%20Out/SonyaBladeMKvsDC2.png> <br/><br/> <br/><br/>Sonya Blade, because, first of all, she was BEAST in MK1, and i loved her red outfit. In Mortal Kombat 3 she was so beautiful, and Sonya was always a compelling character to me, with a very strong, well defined personality i can relate to. MKDA-MKA wasn't great for her when it comes to looks or moves, but she was at her best in MK9. Sonya Blade, because, first of all, she was BEAST in MK1, and i loved her red outfit. In Mortal Kombat 3 she was so beautiful, and Sonya was always a compelling character to me, with a very strong, well defined personality i can relate to. MKDA-MKA wasn't great for her when it comes to looks or moves, but she was at her best in MK9. Wonderfull playstyle for me, kinda fits, really liked how it worked in mk9. MK1. First hidden character in MK evar. Always excited me when he'd show up, and blew my mind when I was actually able to fight him. At the time, I loved the colors of MK anyways, so Scorp and Sub easily attracted my attention. but once a green ninja popped up...Sold. MKT. Fast AND slow forceballs? Dash elbow? Acid bath? Sold. MK4. I thoroughly enjoyed the 3D reveal of his true face. Had one of my favorite endings. & Face Chew. MKDA. I really liked his story with Nitara. I do wish they had worked together to achieve an end they both benefited from. But overall, I enjoyed this bit of MKDA's story. Not to mention his ending is (or was) actually canon and set up the whole damn plot for MKD. Yup, us Reptile fans should feel good about that one. I know I do. Also, HEAD EAT! MKD. ...Onaga was badass though. My favorite boss next to Tsung. MKSM. The costume!!! And his boss fight was my second favorite. MKA. He was way too powerful...Perfect. And costume! MK9. The gameplay was amazing. First time I actually enjoyed every aspect of his gameplay since MK2. Weight Loss was one of my favorite fatalities and Head Eat for nostalgia. Klassic skin. Scorpion <br/> <br/>When I first played MK1 back when I was a kid he was always my favorite for some reason, him and Sub-Zero. I always liked Scorpion a little more though. <br/> Anyway other than nostalgia my main reason for liking him is because I feel bad for him and want him to avenge his family and clan. I totally get why he is so set on revenge. I myself, am a family guy (No pun intended) and my family means more to me than anything else in the world, and if something happed to them I would want revenge too and I would do anything and everything in my power to get it to avenge them. So it really just comes down to me really understanding his character/having sympathy for him. When I first played MK1 back when I was a kid he was always my favorite for some reason, him and Sub-Zero. I always liked Scorpion a little more though. Anyway other than nostalgia my main reason for liking him is because I feel bad for him and want him to avenge his family and clan. I totally get why he is so set on revenge. I myself, am a family guy (No pun intended) and my family means more to me than anything else in the world, and if something happed to them I would want revenge too and I would do anything and everything in my power to get it to avenge them. So it really just comes down to me really understanding his character/having sympathy for him.